We hope you are well and you had a great weekend. This week we've got a new member deal to celebrate the release of Finding Dory. 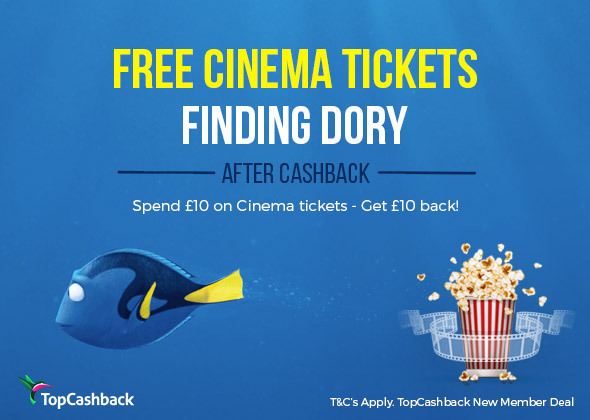 We're offering free cinema tickets to new members signing up to TopCashback. This is one of our snap and save deals meaning purchases from all UK cinemas are eligible. All members have to do is submit a snap (photo) of their receipt. See the easy steps below and we will show you how. 100% Cashback up to £10! All new members have to do to claim their free cinema tickets is follow these four easy steps! New Members enjoy a trip to the cinema to see any movie knowing they'll receive up to £10 cashback. They click on the banner above and sign up to TopCashback; that will take you to the offer page. Members should upload a photo of their recipent, ensuring all details are displayed clearly, then submit their receipt online or via their Mobile App on iOS or Android. After their purchase, they will see the cashback in their TopCashback account within 14 days*. Once payable they can withdraw the cashback to their bank account!